The committee calls the existing system in England and Wales of individual certification "a rubber-stamping exercise". Although debt collection was reformed in 2014, 11 debt and mental health organisations launched a campaign called Taking Control to gather evidence and force further change. Gillian Guy, chief executive of Citizens Advice, said: "Bailiffs regularly break the rules, as our evidence has proved." In the year to March, Citizens Advice saw a 16% increase in bailiff-related issues from last year and helped 40,000 people with almost 104,000 bailiff problems. The charity highlighted bailiffs refusing to set up offers of affordable payments, charging excessive fees and misrepresenting their rights of entry. Of all the people it helped with bailiff issues, 60% were female, 35% were either disabled or had a long-term health condition and of those, 11% had a mental health condition. Ms Guy said: "It's excellent to see MPs from across all parties call for a regulator to crack down on the bailiff industry. They've also rightly called for a complaints process to be established, so problems are dealt with independently of the bailiff industry and outside the court system. "All eyes will now be on the Ministry of Justice, which must introduce these reforms as a matter of urgency." In November, the Civil Enforcement Association which represents civil enforcement agencies operating in England and Wales responded to Citizens' Advice's report that called for tougher regulation. Chief executive Russell Hamblin-Boone said: "It is of great concern that Citizens Advice fails to make a distinction between laws that are broken and laws that people simply don't like. "For example, in the [Citizens Advice] report it is assumed that a threat to force entry to a property or to remove goods required for work purposes is breaking the regulations. That is simply incorrect and depends on the circumstances. It is shocking that agents are being accused of acting illegally based on such flimsy evidence." 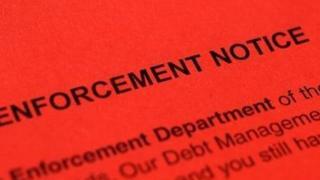 Increasingly bailiffs are used to collect council tax arrears. A survey in 2016 by StepChange Debt charity found that 51% of clients who were contacted by bailiffs were being chased for council tax arrears. On Wednesday the Government said it would improve the way council tax debt is recovered. It said it was bringing in new guidance to help end aggressive repayment enforcement tactics following concerns from charities, debt advice bodies and local councils. Peter Tutton, head of policy at StepChange debt charity, said: "Enforcement by bailiffs is intrusive and places disproportionate costs on people in the most vulnerable circumstances. "It is also key that the committee have recommended oversight of the fees charged by bailiffs to ensure these are proportionate and just."